After a busy day that included laundry and gardening, I settled down in the sewing room for a couple of hours and have completed the second Martha Market Bag. As mentioned in an earlier post, I had originally planned to make this bag when I attended the UFO day at New Threads, Weyhill Fairground but managed to omit some vital “ingredients” when preparing the “kit”. 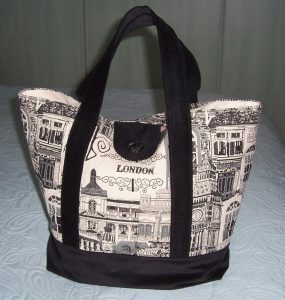 By using the “London” printed canvas that I bought at the Sandown Quilt Show plus some lovely Black corduroy from my stash I have produced a “unisex” bag that my husband can also use when he visits local bookstalls and shops. 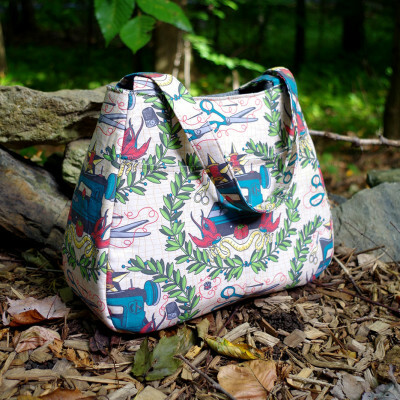 Some changes to the original pattern means that the bag has additional internal pockets. There is a slip pocket with stitched divisions for pens and a mobile phone, a zipped pocket with slip pocket behind and the bag also has a small tab with button fastening for that little extra security. 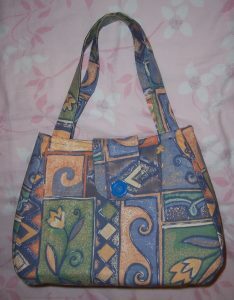 I used plain calico for the pockets and bag lining, the corduroy is used for the bag base, handles and button tab. 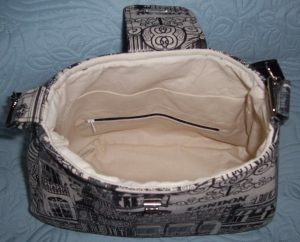 For this bag I have omitted wadding but I did use Vilene F220 medium weight fusible interfacing just to add stability and strength to the outer fabrics and handles. So that’s it for bag making for the moment. It is my birthday early next month so I need to get stitching a new dress for the day – now what fabric and design shall I make? 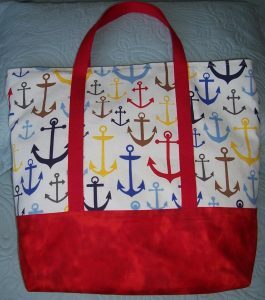 Martha Market Bag- Anchors Away! Saturday 25th June was one of my favourite type of days – all day to stitch and chat at the UFO day, New Threads, Weyhill Fairground. My friend Adrienne and I were joined by 2 other ladies, all of us keen to get ready, steady and stitch. Adrienne took her Jelly Bean quilt to work on and this time around, I took a variety of bags and some half-completed patchwork. 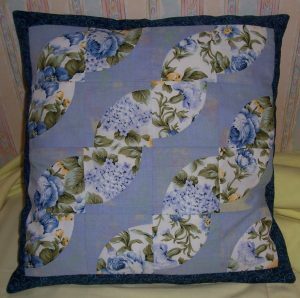 I have already posted a picture of the patchwork – a Drunkards’ Path block in shades of Blue which I made into a cushion cover. For bag-making I decided to try a new pattern. The Martha Market Bag which is a large tote bag designed by “ithinksew” and available for free download from the craftsy.com website. 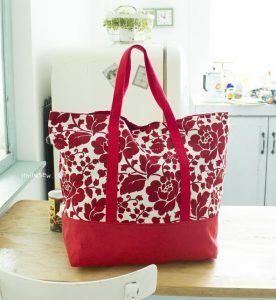 The Martha Market Bag is designed as a market or grocery bag; with its extra-secure handles and large volume, it is the perfect bag to carry many heavy items in. The finished size is approximately 20” wide x 20” high and 5” deep. I packed two sets of materials into polythene bags. Being very organised each poly bag contained the pre-cut fabric outer and lining, handle webbing or fabric, co-ordinating thread, interfacing, wadding and pre-made zipped and slip pockets complete with my Carousel Cottage Crafts printed label and finally magnetic snap fasteners. However, I did slip up as had I mis-read the materials list and packed only sufficient webbing or fabric for ONE handle, not two. Bother!! All was not lost as I was able to prepare and stitch the bag linings and one side of the outer for each bag. Now back at home I am able to finish off my UFO’s in the chaos that is my sewing room. 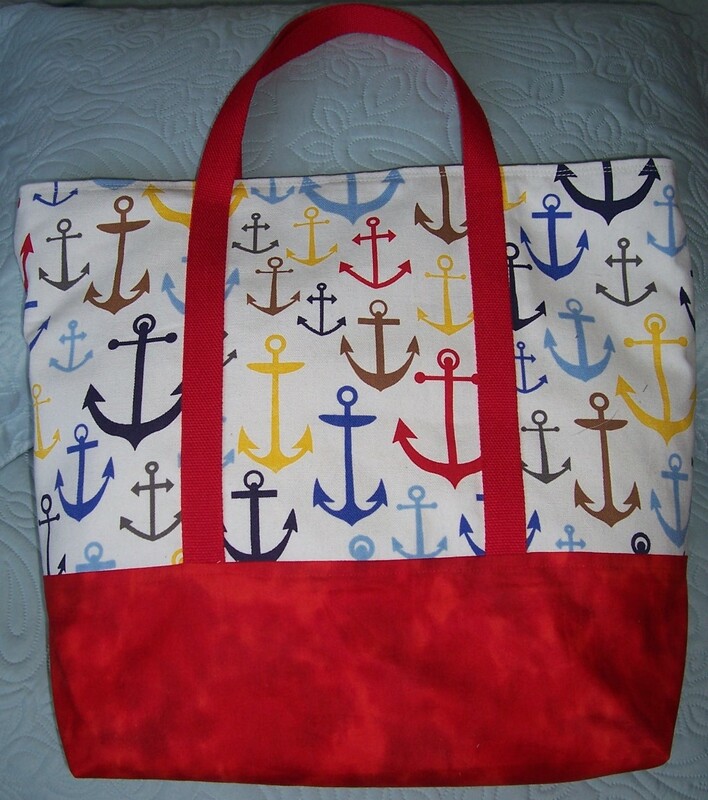 The first bag to be completed is “Anchors Away”. I used a great canvas fabric printed with a variety of anchors in different colours and sizes on a White background that I purchased last week at the Sandown Quilt Show. The base section of the bag is made using a Red Quilting Cotton purchased from New Threads. I already had a large reel of Red webbing for the handles. The lining is my usual stand-by of White Polyester cotton with the pockets made in remnants of textured White damask fabric originally purchased several years ago at Oswaldtwistle Mills. I knew it would come in handy some time! 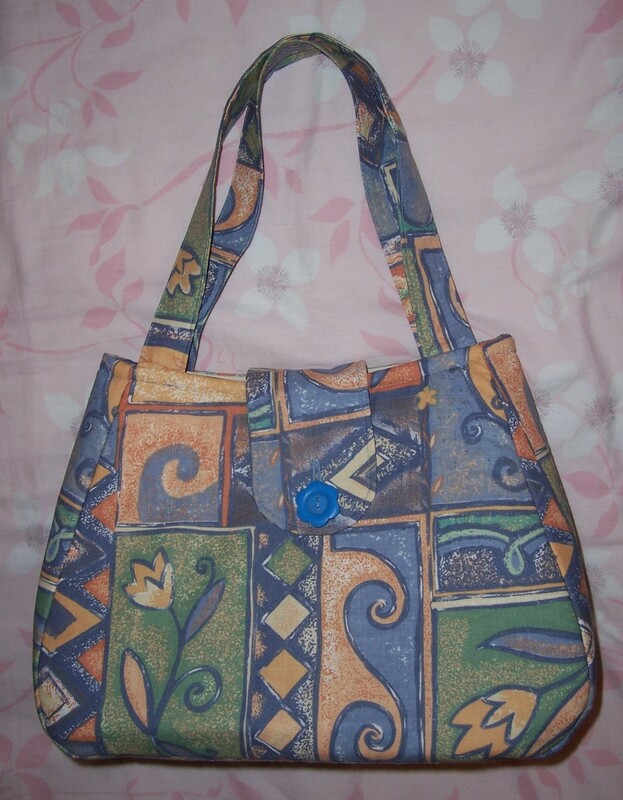 The Martha Market Bag pattern is a great design. It goes together simply and quickly. You can decide whether or not to add pockets and/or magnetic snap so each bag can be a quick sew or take a little longer and will always be unique. 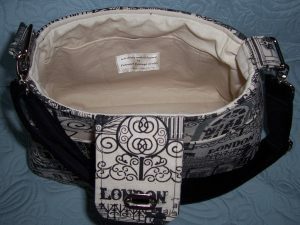 Now onto the next bag – this will be a Book Bag for my husband using the same LONDON print that I used for the Ethel Bag which is now winging its way to Germany. A couple of weekends ago, I attended the Sandown Park Quilt Show. This was the first time in two years that I have felt able to drive to and visit a show under my own steam. The drive to Sandown was pretty tortuous as it involved a long slow drive along the M3 (high volume of traffic and roadworks) followed by more of the same on the Eastbound M25. However, I did eventually arrive and was met by a friend with whom I shared the day. The show was not too busy and I was able to meander around the various stalls – oohing and aahing at the great variety of sewing bits and pieces available. It was great to be back in the swing of things. 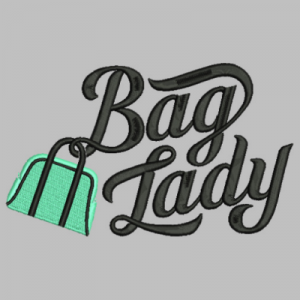 As you will know – I am “into” bag-making! I bought several lengths of fabrics which so far have not even made it into the bag-making box as I have immediately started cutting out and preparing them to take to the UFO day next weekend! 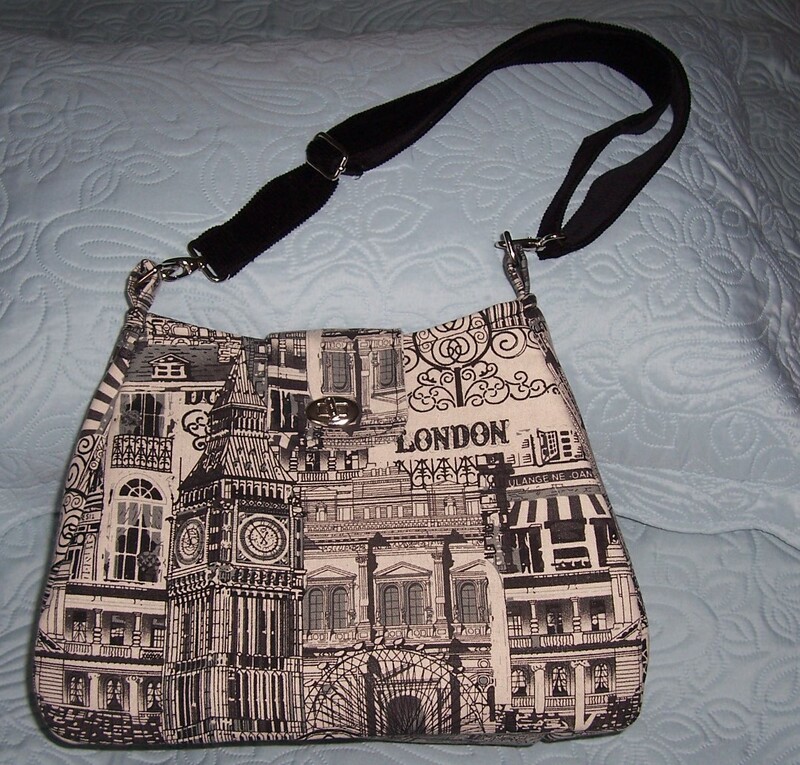 The first make was a second version of “Ethel”using a canvas weight fabric printed in Black and Grey onto Cream background and featuring LONDON landmarks. 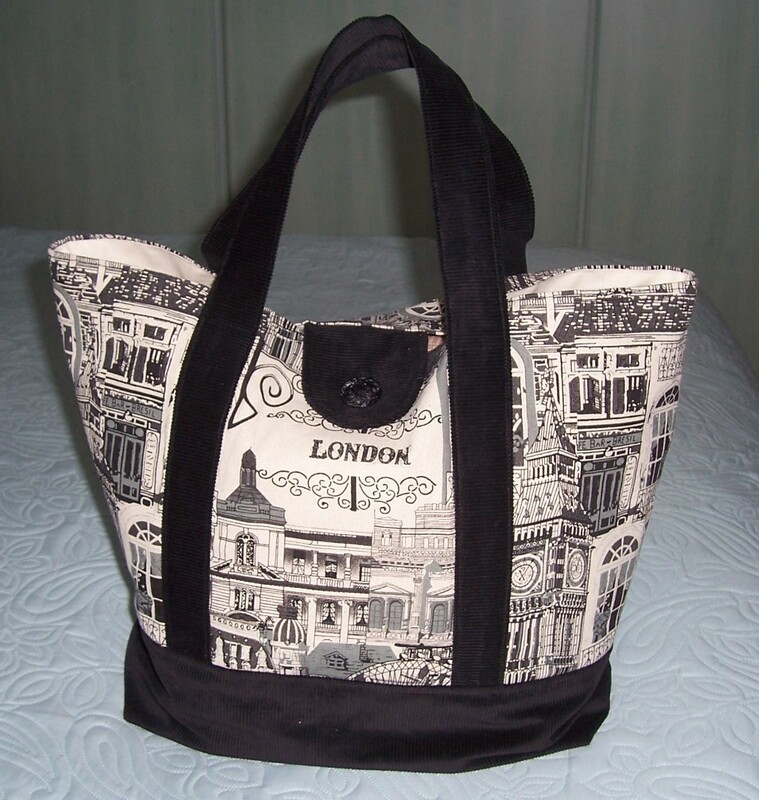 I had decided that regardless of the outcome of the EU referendum, I would make a bag for my internet sewing friend Antje who is based in Germany. When printing off the pdf pattern I made doubly-sure that the size was correct as I believe my previous make was a little smaller than it should have been. I interfaced all the outer pieces and lining sections of the bag with Vilene F220 medium weight fusible interfacing. Then I used Bosal ® In-R-Form Unique Sew-In Foam Stabiliser for the main outer panels which gave the bag that extra special support and makes for a very professional-looking finished bag. I made a few changes to the basic pattern. This time I made an extra long strap in contrasting Black corduroy fabric and affixed to the bag with nickel rectangles, swivel clip hooks and also a strap length adjuster. I repeated the small flap and added a nickel twist lock for security. Inside the bag are two pockets. One has a “letterbox” zip closure and the other is a slip pocket with several sections designed to accommodate pens, mobile phone etc. 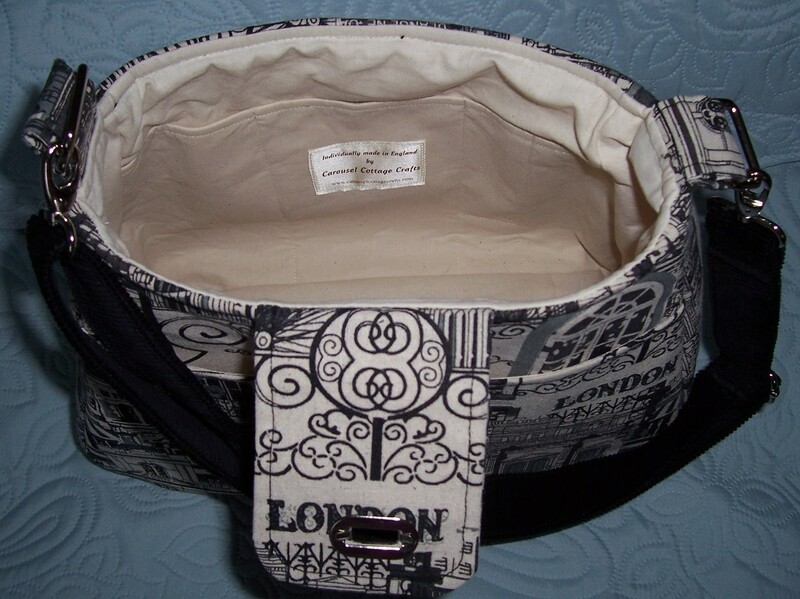 I have posted the bag off to Antje and am keeping my fingers crossed that it arrives safely and that she will enjoy her “London Ethel”. At the Monday meeting of P&Q at Franklins in Salisbury, this month was dedicated to die-cutting. Maureen, Pat and I all took our die cutting machines and assortment of dies to the shop so that we could demonstrate these “really useful” pieces of equipment. All three of us die-cutting enthusiasts have Accuquilt GO! Machines whilst I have an additional Sissix Big Shot which I bought when I originally “got into” die cutting. My introduction to this method of preparation for quilting was the desire to make an “Applecore” quilt. 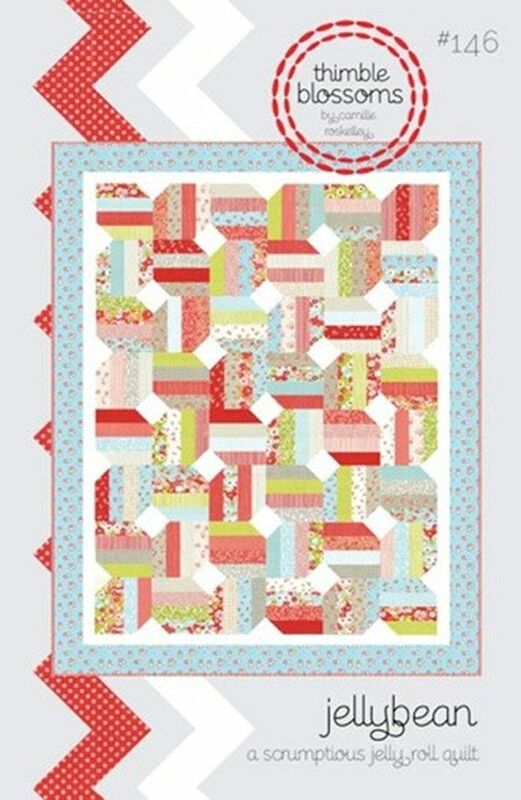 I have since made at least three quilts using this particular die which I must admit is my favourite. The ladies at the meeting were all very impressed with the speed and accuracy of cutting of blocks and particularly those pieces which had curved outlines e.g. Applecores and Drunkards’ Path. 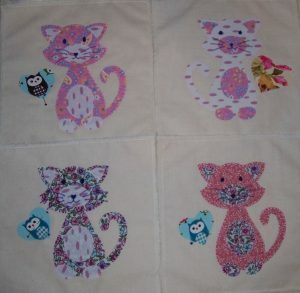 Since the meeting I have made a Drunkards’ Path cushion cover and continued to work on some cat applique blocks that I intend to use for an “Owl and the Pussycat” quilt for my lovely cat “Jazz”. 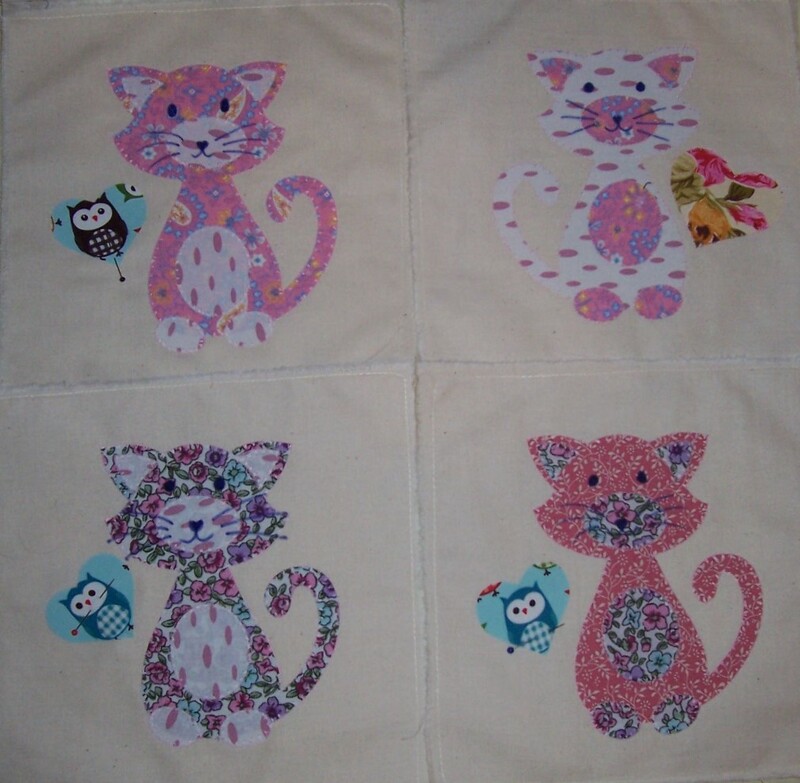 I am using a cat die for the “Pussycat” and alternate blocks will be made from remnants of the “Owl” print that I used for my “Bettina” dress. I have been an avid watcher of the vlogs by Lisa Comfort of Sew Over It and eventually decided to bite the bullet and purchase the “Betty” dress pattern. I am of a certain age and added the sleeve and neckline add-on pack as I am not very comfortable with sleeveless dresses (unless I can cover up with a bolero-style cardigan or jacket!). As the Sew Over It patterns are a new adventure for me and the dress takes a great deal of fabric (4plus metres), I knew that I would be making a toile before cutting into the precious owl-print cotton fabric. Using some remnant sheeting that was originally used to back a quilt, I compared measurements and made the usual adjustments to the pattern. N.B. I don’t actually adjust the original pattern as I like to keep a pristine copy, I copied the “master” onto flip chart paper and then made the alterations. I cut and stitched the toile and had a fitting. Oops! Not good. The bust darts were still too high, the neckline far too wide and the entire bodice was too short. I pinned some changes and then unpicked the toile and re-drafted the bodice pattern. 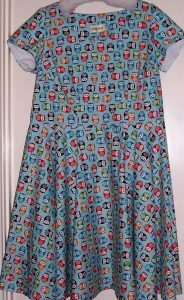 By now I was getting “antsy” and really wanted to get on with making the dress rather than spending my precious sewing time making toiles. I turned to my TNT bodice pattern. I copied off the front and back bodice, re-drafted a scoop neckline and added some cap sleeves. 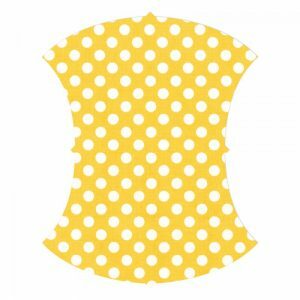 I would still like to have a circular skirt so compared the measurements at the waist of the bodice to those of the skirt front and back. I added sufficient so that they matched and then went ahead and cut my fabric. I cut a lining for the sleeves from plain White poly/cotton and interfaced the neckline facing with fusible Vilene before settling down to stitch. Although the pattern calls for an invisible zip, I found a standard zip in just the right colour in my zip stash (from when my father worked at a zip factory) which I set into the centre back seam using the “lapped” method. 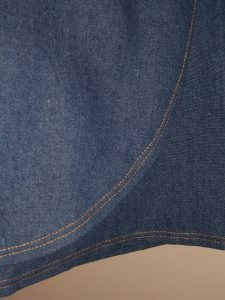 I used a triple zig-zag stitch for the understitching of the neckline facing and sleeve linings. 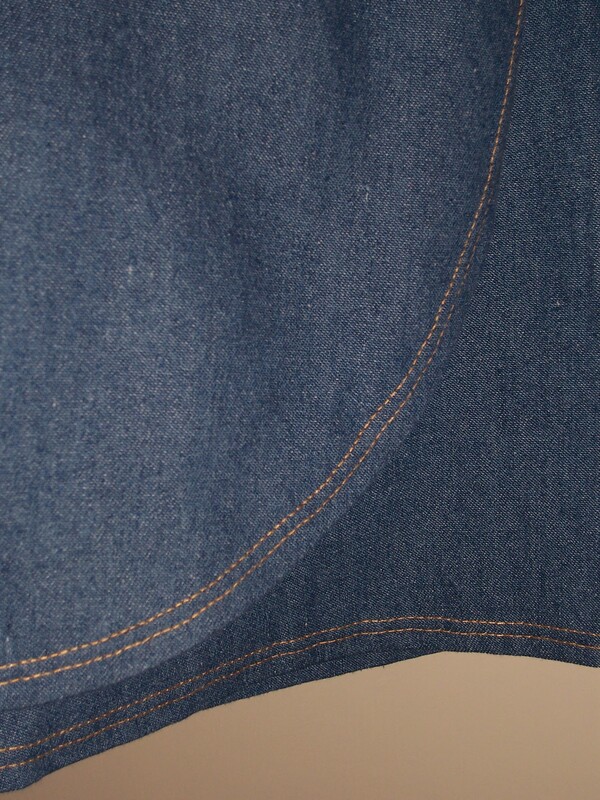 All seams are overlocked and the hem is machined. The dress was completed in a little under 4 hours. I found a lovely little frilled edge bolero cardigan in my wardrobe to wear with it and am delighted with my new outfit. I attend a Patchwork & Quilting Group once a month that is held at Franklins in Salisbury where I have made several good friends. One of them, Maureen, has recently made something for me and in return, I decided to make something for her! I browsed the internet for bag patterns and was delighted to find this one, the Ethel Tote bag on the Swoon website and the extra brownie points were that it was a FREE pdf pattern. The bag is described thus – a roomy, sturdy and stylish open tote bag. With a teardrop shape, Ethel veers away from the usual boxy tote. It’s a “stuff it in and run out the door” kind of bag, designed to comfortably sling over your shoulder. There are a few slip pockets for the small things. 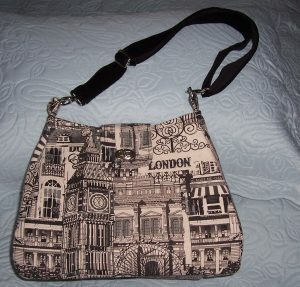 Bag dimensions are 9.5 inches wide at the top, 13 inches at the bottom, 5 inches deep and 10 inches tall. 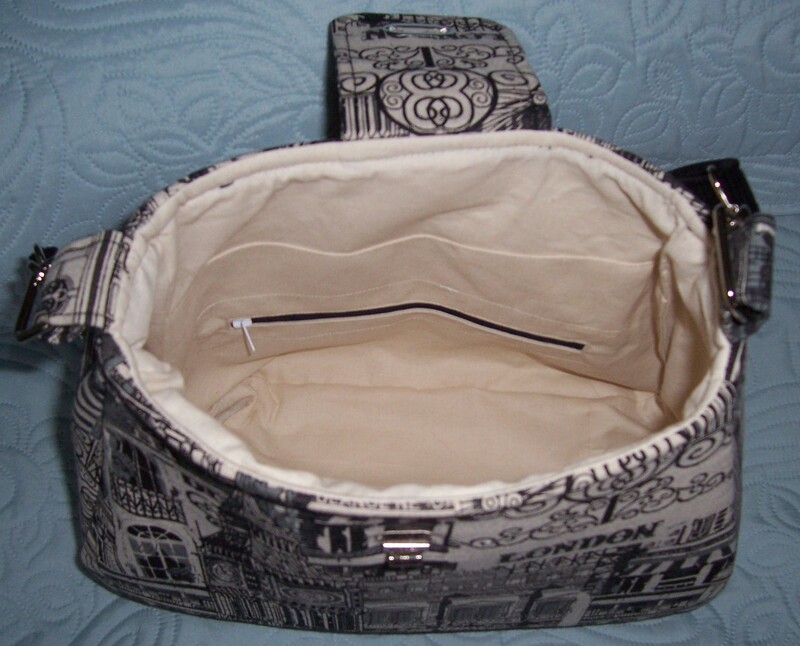 I downloaded the pattern and instructions and then visited my Bag-making box of fabrics. I found this pretty printed curtain-weight fabric that was a remnant from my Utility room curtains. I believe that Maureen likes Blue so decided to use this fabric and combine with some plain calico for the lining. I interfaced all the outer pieces and lining sections of the bag with Vilene F220 medium weight fusible interfacing. Then I used Bosal In-R-Form Unique Sew-In Foam Stabilizer for the main outer panels which gives the bag that extra special support and makes for a very professional-looking finished bag. The bag went together really well. As there are no zip pockets in the bag the only change that I made was to add a small flap to go over the top of the bag to be fastened with a pretty flower-shaped button and buttonhole which will provide a little extra security. Maureen was delighted with her bag and having re-visited the website I have also made the embroidered label/panel for her to use on her next bag-making project. 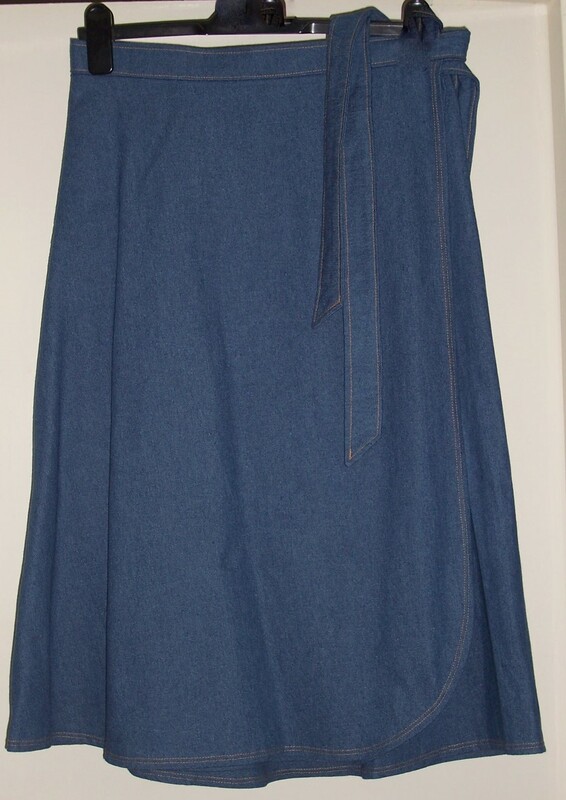 When reviewing my wardrobe of Summer casual clothes I noticed that I needed a new denim skirt. 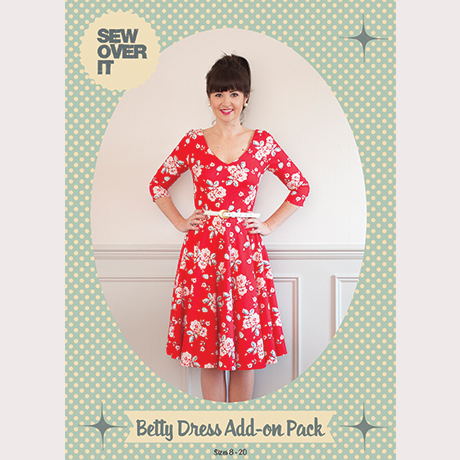 This was an easy omission to rectify – I could quickly run up a wrap skirt from my TNT pattern. I used a lightweight denim with a little stretch purchased from Fabricland, Salisbury branch. 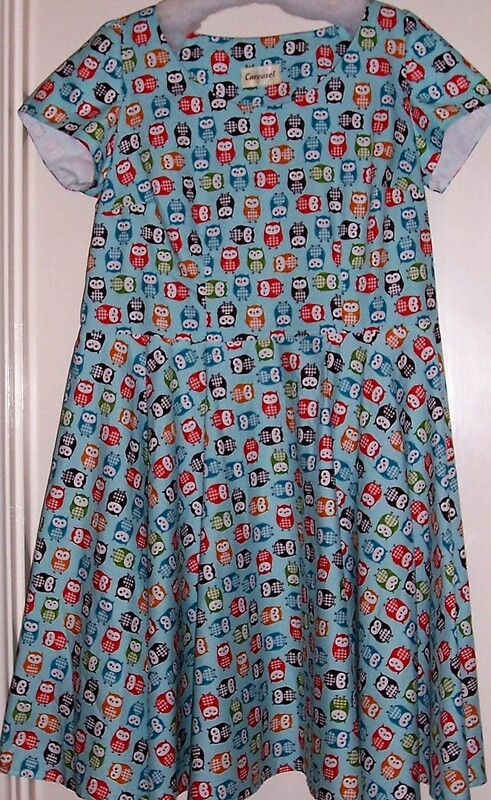 This fabric comes in a wide width and therefore I needed just 2 metres to make the skirt. I cut out the panels and this time rounded the leading edge of the under and overlaps. All seams and raw edges were overlocked. I used an Orange contrast thread to double top-stitch the centre back seam and also the hem which was turned up by just 5/8 inch. I set pockets into the side seams, and this time stabilised the slight bias of the side seams with a little fusible webbing. It appears to be stopping the pocket openings from gaping so I will do that on future wrap skirts when I have side seam pockets. Another solution could be to top stitch the opening. For the waistband, due to the thickness of the fabric I used fusible interfacing only in the band that was attached to the skirt, the ties are not interfaced which makes tying a bow or knot a little easier. The entire waistband and ties are again top-stitched in the Orange thread. I have a couple of pockets which I intend to apply to the back skirt panels but before I do that I want to practice some decorative twin-needle stitching. Watch this space….. Earlier I had made a Sorbetto top using the free downloaded PDF pattern from Colette patterns. It ended up being rather a hack as I had to add sleeves. For my final make of May 2016 I decided to have another go at the vest top. 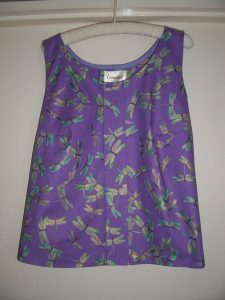 This time, armed with the FBA (full bust adjustment) I decided to use this fabulous dragonfly printed cotton fabric from New Threads, Weyhill Fairground. Construction was simple and straightforward. 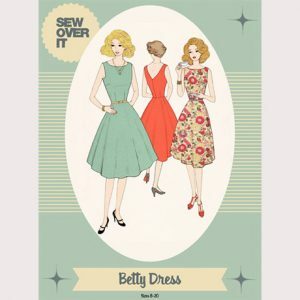 Bust darts, front pleat, shoulder and side seams, bias binding around neckline and armholes, machine the hem and you are done! If anything, this top has come out a little short, probably because the fabric was expensive, I was mean with the yardage that I purchased. Next time, and there will be a next time, I shall extend the bodice to give a shaped hem that looks better when worn outside trousers or skirts. 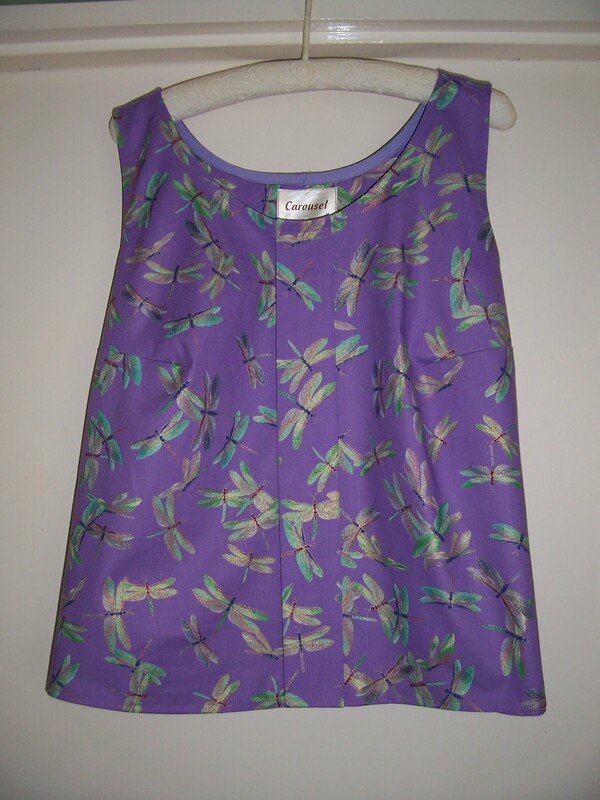 Meantime, this top looks fab worn with White Capri trousers and my favourite Lilac shoes – bring on the sunshine! Whilst my husband was away on Retreat I knew that I would enjoy a “SewFest”. I had many plans for dressmaking, quilt making and soft furnishing. 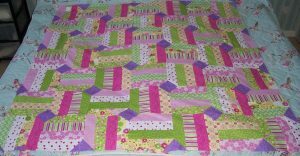 The “Summer Jellies” quilt started at the Rookwood Day was completed within the week. Next on the “to do” list was a set of curtains and cushions for R’s study followed by a refurbishment of the main bedroom. 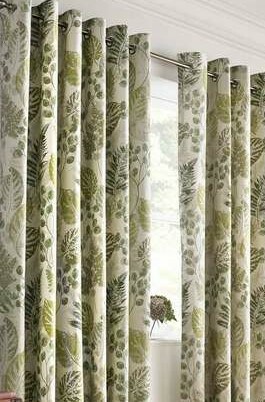 I am not a fan of curtain-making so decided to purchase ready made curtains for both rooms. A visit to Dunelm Mill (my 1st of what was eventually 4 trips!!) 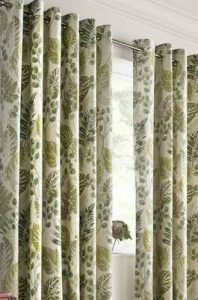 I chose a natural fibre curtain with eyelet heading and printed with various leaves for the study. Unfortunately (or fortunately as it turned out) I bought a set that were much too long. I cut off the excess and re-hemmed the curtains to the correct length which left me with two pieces of fabric 18” wide x 66” long. I made the pieces up into two cushions for the Lloyd Loom chair which now gives the room a co-ordinated look. On to the bedroom. 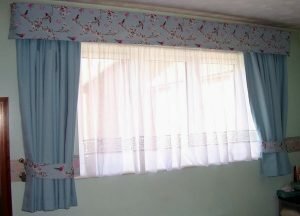 I chose a set of Thermal Black Out lined curtains with standard tape heading in a textured Duck Egg Blue. 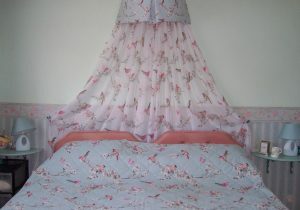 This went well with the existing colour scheme of the room and also the bedding which I had purchased a few months ago. But I needed a Pelmet. I purchased some furnishing weight fabric from Dunelm Mill that has the same print as the bedding but on a smaller scale. I made a flat pelmet which I lined with Calico and used a 3” heading tape. 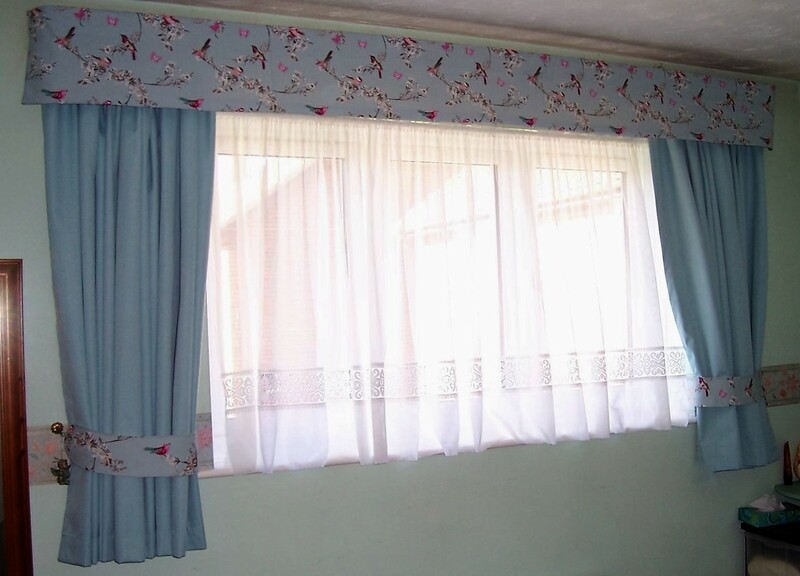 The completed pelmet was attached to the pelmet curtain track and along with a set of co-ordinating tie-back, I think finishes off the window dressing beautifully. Over our twin beds, we have a Half Coronet fixture. This needed to be re-covered. Again using the same fabric as the curtain pelmet I made a new cover, a flat skirt with a simple inverted pleat at the centre front. 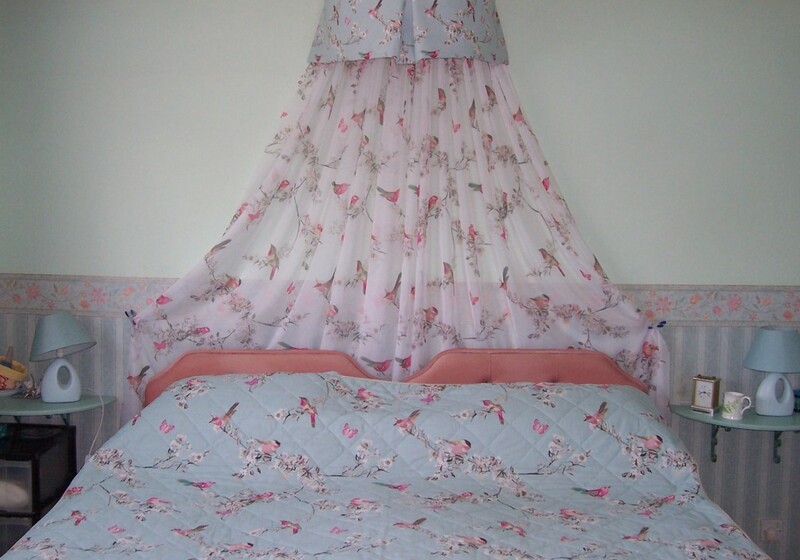 The background to the headboards has a set of printed voile curtains which again co-ordinate with the bedding. Finished – a fresh new co-ordinated scheme in our favourite colour scheme of Duck Egg Blue. In May we again enjoyed a Retreat Day at Rookwood School. This was organised by the Committee of Sprat & Winkle Quilters, led by our Chairman, Lizzie Rudd Clark. We had been asked to bring a Jelly Roll and be prepared to make up one of the suggested designs that Lizzie and her team had prepared. I had two “Jellies” purchased from Create and Craft TV in lovely Summery colours which I thought would be ideal to make a “Summer” quilt for my husband’s grand piano. The block design that I chose was called “Jelly Bean” and incorporated “snowballed” corners to the individual blocks of 4 strips of jelly roll. I took my “Jellies” to New Threads, Weyhill Fairground for some advice. What colour should I use for the accent? Meg initially suggested Grey but we settled on a Dark Lilac. I bought a metre of fabric – I do not want to run out and I knew that I would use some of the accent fabric for a narrow border. I finished stitching my blocks at home and then laid them out on the bed. Photographs helped to decide the arrangement and they were all stitched together. I added a narrow border (1” finished) of the accent Lilac and then completed with a border of 2” (finished) squares using the remainder of the Jellies plus some Fat Quarters I had bought at Franklins in Salisbury. The binding is the Lilac again. 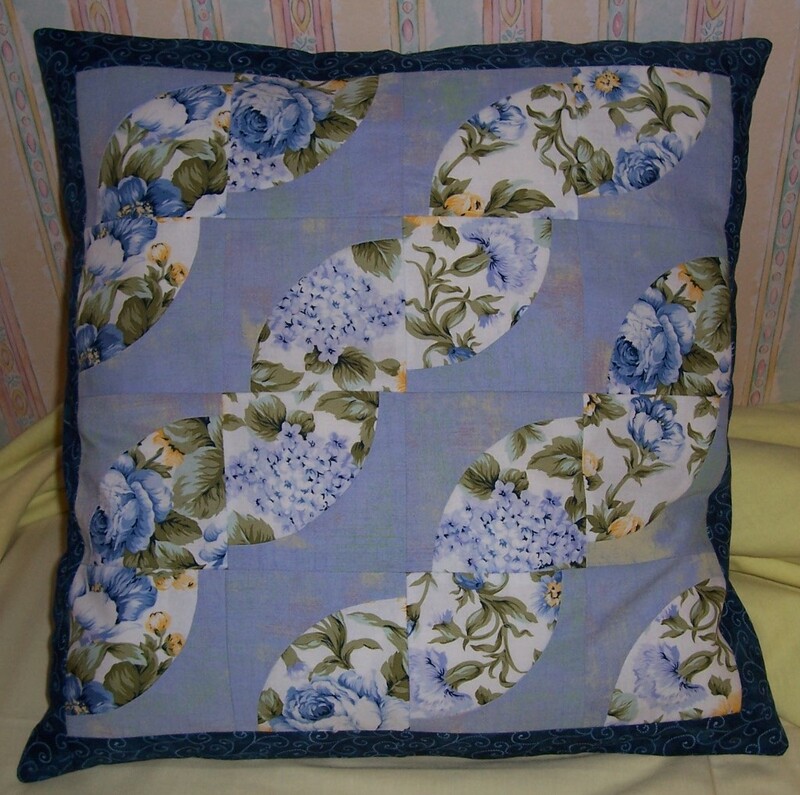 I used a 2 oz polyester wadding as I wanted this quilt to be lightweight – it is for the Summer after all. The backing is a Dusky Lilac sheet from Dunelm Mill and the quilting is simple “stitch in the ditch”. I managed to get the quilt completed and able to display on the piano in time for my husband’s return from retreat. He noticed it immediately! As soon as I can, I will post a photograph of the completed quilt but meantime, onto the next project – new curtains and soft furnishings for my bedroom.